Looking for more standard adventuring gear to outfit your character? Adventure Gear 2 is here to round out all the equipment you need with this 54-card set of beautifully illustrated full-colour item cards. 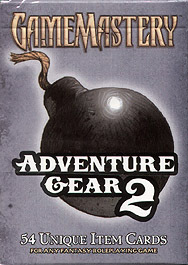 A sequel to the first set of Adventure Gear. This deck can be used independently to help track the equipment your character needs to survive the deadliest dungeons. Unique codes and space for notes help you and your players track their loot.